Occasionally we have well bred and socialised puppies for sale, born from healthy parents with perfect temperament and proven working ability. Of course every puppy is vaccinated and wormed, and is accompanied by a pedigree issued by the LABRADOR CLUB DEUTSCHLAND (VDH / FCI / JGHV). „we are searching for a chocolate Labrador puppy“. (It is not always chocolate, but may be any other currently fashionable colour as well). Our reply is generally that we do not breed to produce specific colours. 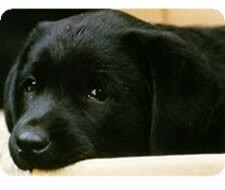 We think it is difficult enough to follow our concept of breeding healthy dogs that look like Labradors, but neither like molossoid types nor like starved Pointers; dogs that are level-headed and that have the talent to turn out as good working gundogs, if they receive proper training. And then, after we have given this statement, we may get the answer „well, he should be healthy…“ To make this fact crystal clear at the beginning: We do not breed dogs for people who put coat colour on their priority list first and above health and working talent. 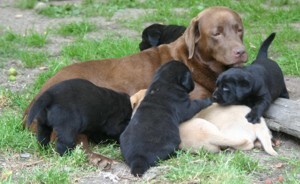 If you are interested in one of our puppies, we ask you to tell us as detailed as possible what you expect from your future puppy, and we shall try to tell you as clearly as possible what you can expect from a LABRADOR AUS LÜHLSBUSCH. Our ideal puppy buyer (m/f) is not primarily interested in colour, but hoping to get a dog bred by experienced breeders whom he may contact during the whole life of this dog and ask for help if smallish or big problems should come up; he has already collected information about the breed and about breeders that might produce the type of Labrador he is hoping to buy; is prepared to travel beyond county borders to select his canine friend for the next years to come and is prepared to wait for the „right“ litter; has already invested some thought into training classes for his puppy and into the tasks the dog should master during his adult life. In former times people bought dogs because there was a job to be done by them (working sheepdogs or gundogs) – today people like to buy a dog bred for work and then start to invent jobs for him. 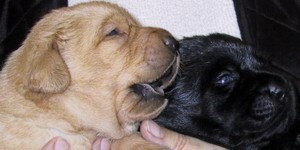 Remember: The Labrador Retriever is a gundog breed! Many other breeders classify our kennel as „dual purpose“, we do not like this tag. We breed Labradors according to the KC/FCI standard, and hopefully they are talented and trainable enough to fulfil a variety of tasks with joy and fun in cooperation with their handlers. We hope that they have excellent breed type so that they can successfully compete for top places in the show rings. 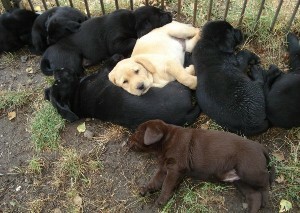 Do you have the time and patience to educate and train a very agile Labrador with well developed hunting instincts? Are you aware of the fact that Labrador puppies are infamous for their ability to reconstruct a garden and to chew just about everything they come into contact with? 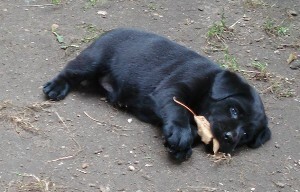 A Labrador is only a cute little puppy for a few weeks. Very quickly it becomes a big teen-age dog who has a great sense of humour, very inventive and full of boundless energy. Do not expect a Labrador to be a mature dog for two to three years, but do expect to spend a good amount of your time trouble shooting many – growing-up – issues, sins and crimes! Relapses to thievish status, even in high age, should always be anticipated, especially if something edible is left unattended. (Once upon a time there was a christmas cake … photo right). 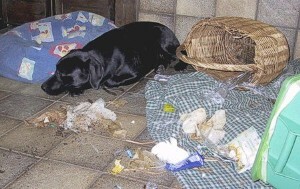 A Labrador regards nearly everything in his surroundings as „edible“ – our own experience gained in every day life and during surgery hours tells us, that for every letter of the alphabet there is at least one object which at the discretion of humans should be classified as inedible, but has already been eaten by a Labrador. This includes all types of carrion (with a happy roll-over on top of it before the meal), added to that some socks, wood in various forms including furniture, stones, cowpats and other droppings, golf balls, leather leashes including metal fittings, plus a multitude of other items.The listing of those can easily fill a book – take a look round, the world consists of „edibles“ for a Labrador. You have to prepare for the fact that your Labrador will love to be in close body contact with you for all his life, that it will carry mud from the daily walks, and that it will spread lots of hair all over the house, all year round. Are you fanatic about the immaculate cleanliness of your surroundings? Then you should forget about this breed, now! Puppies are not manufactured in a plant or on an assembly line. They cannot be tested in a laboratory, or technically inspected for quality. They are living beings, created form two other living beings, none of which are perfect. We as breeders test the parents for disorders and only breed from dogs that are certified free of these problems. But surgeons can have diseased children, and so can healthy dogs have diseased offspring. Even if this risk is reduced by selective breeding, it still exists. 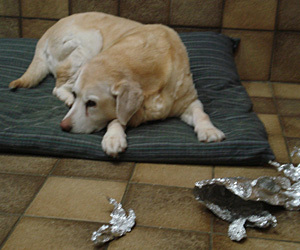 Bad things can and do happen to good dogs – there are no guarantees in life. We try our best as breeders, but there is so much we do not know and so much that the individual who rears the pup contributes to the success and health of the puppy. We supply our puppy buyers with detailed information about feeding and rearing; this should help them to rear their young dog into a healthy adult. We like to keep a permanent contact with our puppy buyers for many years, and try to help them with information and training whenever required. We insist that all dogs from our kennel are x-rayed on hips and elbows when they are one year old, and this is part of our sales contract. might be a suitable new member of your family, we are prepared to answer all relevant questions. Visitors are welcome on appointment.